to the Edison Boys Varsity Soccer on a their win against Santa Margarita Thursday night. Chase Bullock scored the game winning goal with an assist from Wyatt Burris in the 2nd OT period. Edison advances to Round 2 of CIF Playoffs and will face Palos Verdes on the road at Palos Verdes High School. Game time is set for 2:00pm Saturday 2/9. Come out and cheer as our team battles for their place in the CIF quarter finals. Go Chargers! 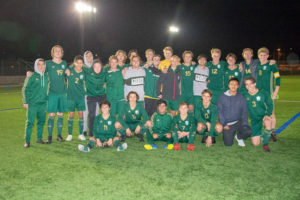 © Edison High School Boys Soccer 2019. Powered by WordPress and Sports Team Theme.